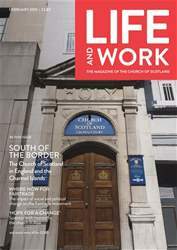 Peter Kimber’s letter in the December issue of Life and Work about the use of projected words and images was stimulating. When I served on the Church’s Committee on Church Art and Architecture (CARTA), proposals to install screens in churches were beginning to proliferate. The Committee could see some merit in the concept but was concerned that it might adversely affect the quality of settings for worship. Over the years my experience of the use of projection has led me to the following conclusions. Firstly, and very seriously, it can take away much of the atmosphere of public worship, which I believe is essentially a communication between God, Father, Son and Holy Spirit and the congregation, both as a body and as a collection of individuals. Singing from words on a screen takes away from the individuality involved in finding a hymn in a book, and deprives people of seeing a hymn as a whole, finding out when it was written and by whom, and seeing how it relates to other hymns.